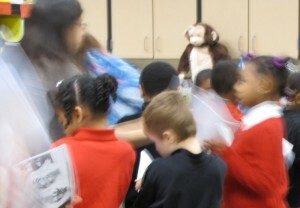 Last year I just had some of the 5th graders read to the pre-k, kindergarten, and 1st grade classes. I say “just,” but it was my first year and it was a big deal! But this year I was much more comfortable with it. 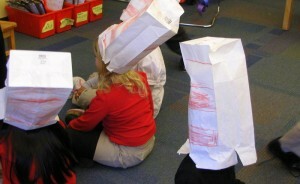 I still took over the 5th graders reading to the youngest kids and making the Cat in the Hat hats. But this year the entire 5th grade participated. 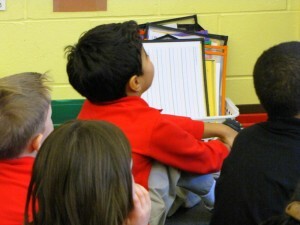 And our reading teacher worked with her 2nd, 3rd, and 4th graders to read books over the PA system all this week. 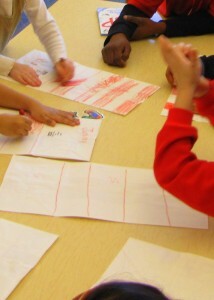 She also put activities together for the teachers in those classrooms. So we have readings happening all week, but today was our main celebration and my big day. I’m exhaling now. The 2nd graders who work with our reading teacher read I Can Read with My Eyes Shut! over the PA system during morning announcements. 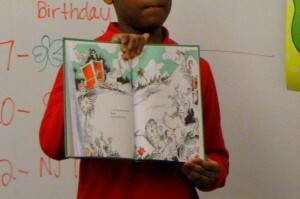 The 5th graders expertly show the little guys the pictures before turning each page. My work here is done! 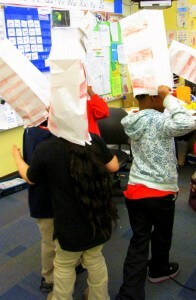 Making our (now) traditional hats out of white paper bags.